How do we support Nonprofit Capacity Building? The Responsive Grant program, allowing organizations to request funding to send staff members to professional conferences or engage in strategic planning. GiveBigNRV, a central community giving portal (cfnrv.givebig.org) that has helped over 90 local nonprofits to raise money online and to utilize social media and other fundraising tools. The Third Thursday Society series, a free, monthly networking and educational program with hour-long talks on nonprofit management topics. One-on-one consultation and facilitation for 6-10 organizations per year. Altogether, these programs serve over 100 unique organizations in the New River Valley and hundreds more individual staff and board members. Although each of these approaches has helped to strengthen our nonprofit sector, we continue to receive requests from individual nonprofits for more in-depth support around issues such as strategic planning, board and staff relationships, and fundraising. Provide more intensive half and full day workshops on priority non-profit professional development topics, such as strategic planning, social media, and fundraising. These workshops will serve as a testing ground to identify course content, format and trainers for the full institute curriculum. Develop a comprehensive cohort-based model, giving participants the opportunity to learn and practice new skills over the course of a year and to build relationships that expand and strengthen the NRV’s network of nonprofit leaders. Offer a board development training for nonprofit board members that covers the fundamental nonprofit governance concepts every leader should understand, including board structure and practices, the roles and responsibilities of board members, and financial and legal oversight. 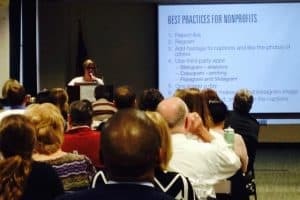 The CFNRV and the Foundation for Roanoke Valley are working together to host workshops with expert speakers in important nonprofit management topics. For example, over 100 nonprofit leaders participated in a Social Media Workshop in both 2016 and 2017.